At first glance, nothing looked “messy” in Señora Eisinger’s junior high Spanish class. I had arrived to help students connect their Canvas (Learning Management System) accounts with Office365, in particular, to a OneNote Class Notebook through which Señora and her students would connect digitally and collaborate over the coming year. When I entered, students were seated and still, reviewing the day’s objectives. All was peaceful. All was traditional and comfortable. All was quiet. Digital connection and collaboration, though, don’t lend themselves to quiet, traditional practice – and they are rarely peaceful to set up! There’s the matter of accounts – Are you logged into Canvas? Good. Now log into OneDrive on your iPad. Oops – No, that must be your personal account – you need to find your school account. What? You don’t see your Canvas course for Spanish class? Okay. Click here. Your page won’t load? Forget the wifi and sign in again. Everyone had a different issue. Señora Eisinger and I ran from desk to desk, trying to troubleshoot each individual problem. Then something beautiful happened. The first student to complete the process jumped out of her desk and began to help a neighbor. Pretty soon, students were huddled in small groups, helping one another with the connection process. The room was noisy; the desks were askew. And yet, 21st century learning was happening. In their troubleshooting to connect accounts, students were working together to solve a real classroom issue. These young teens were practicing the soft skills that today’s employers desire: the ability to work as a team, communicate clearly, and come up with creative solutions. On top of the powerful web filters that HSE Schools has in place to protect our students, our schools use many additional strategies to streamline web access in order to keep our students safe. Thanks to Geist Elementary School for sharing these tips! As we begin our second year with iPads in the elementary schools, the GES staff is more dedicated than ever to keeping students safe as they use the web. One way we do this is through the use of QR codes. Teachers create QR codes often to provide students with a way to go directly to one particular web page – no ‘searching’ necessary. For example, Krista Beck’s first grade students recently used QR codes to travel directly and link to two websites they’ll be visiting all year. The students first scanned a QR code that took them directly to the GES Student Links web page; then they created a shortcut to this page for their iPad home screens. The first graders will use this shortcut to directly access approved sites throughout the year. Next, Mrs. Beck’s class used a QR code to connect to the GES Library’s Symbaloo, an icon-based collection of curated web links that students will also use in first grade. A shortcut to the Symbaloo was added to iPad home screens for future reference as well. The GES Symbaloo provides safe access to approved websites. QR codes and Symbaloos are two easy safeguards to make it less likely that a student will arrive at the wrong destination, and they eliminate the need to enter long or complicated web addresses – sometimes time-consuming with our youngest learners. With less time spent on typing addresses and finding particular websites, more time is devoted to the real task at hand: learning! QR codes can be created through sites like www.the-qrcode-generator.com or www.qrstuff.com and then printed or projected on to a screen for easy access. Symbaloos can be built by anyone. A free account is available at www.symbalooedu.com . Amazing how a simple conversation between educators can spark a cross-curricular, global, enduring learning experience. Thanks to Mrs. Kussy & Mrs. Robinson (3rd grade) from Brooks School Elementary for writing up this incredible HSE21 project to share with us, to Mrs. Patrick (BSE Media Specialist) for the video story, and to the many third graders who, through Wikispaces, are teaching the rest of us about some wonderful, insightful books! It started as a simple collaboration between us and Mrs. Patrick and with a goal: get powerful diverse books into the hands of third graders and effectively use them to help students learn to identify a theme and support it with explicit text evidence. The books the students are reading are in the BSE Library’s collection of diverse literature which was purchased through the “Windows and Mirrors” grant — an HSE Foundation Grant that Mrs. Patrick received in 2015. We began with three simple goals for our students. First, read and enjoy books with diversity. Second, identify the theme and support it with evidence. Third, share it beyond our classroom walls. Of course, Mrs. Patrick had a brilliant suggestion to create a class Wikispace website as the avenue to share these beautiful books and the student’s thinking and writing. Each class created its own Wiki to do just that. Students are united together in one space sharing their thoughts globally while reading diverse global texts. Students began the year sharing responses and reflections in a personal space, notebooks. Then they moved to sharing reflections via a classroom space, Seesaw. So a natural progression was to move to a global space for sharing, a Wikispace. Weekly, students are self-selecting diverse books of interest to read and share their thinking. As they do this, they are able to add to other classmate’s posts to support their thinking with more evidence. Our next step is to have digital discussions about their affirmation or opposition to the same pieces of literature. Throughout this entire process students have had to opportunity to discover that they are connected in some fashion with leaders of the past or present, and realistic fictional characters. Naturally, this had led us as teachers to discuss global issues being addressed through the United Nations Global Goals for Sustainable Development. Along the way students are discovering leaders, real and fictional, representing cultures and diversity from all around the world and are in turn identifying these places on the world map. As we step back and analyze the work the students are involved in, it is addressing every content area and more. All of this work is “Encouraging Leaders Through Literature”. Learn about many diverse books on our class Wikispaces! Teachers, Families and Community Members – please join us to discuss this timely and relevant topic! No need to register – just show up! Printable flyer available here. How Do Our Kids View Technology – Toy or Tool? The thoughts below are my own; they are not intended to represent the views of HSE Schools. A decade ago, when Facebook was new and my children were on the cusp of adolescence, my husband and I had decisions to make. These weren’t new decisions, merely the next phase of parenting conversations we’d had periodically over the years. Our essential question went something like this: What did we, as a family, believe about media and technology, and what would be the parameters of media use in our home? In 1989, when Eli made his appearance, ‘media’ meant time spent watching Sesame Street, Thomas the Tank Engine, and Reading Rainbow on PBS. 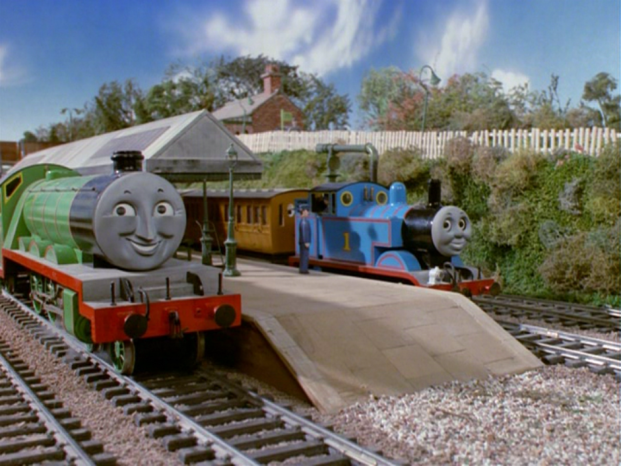 In Eli’s preschool years, he adored Thomas the Train; but there was never a danger of media overload…Thomas was only broadcast for one half hour a day. Digital parenting was easy. Several years passed. Media options were exploding, and our now three children seemed to gravitate toward any and every screen in eyeball range. 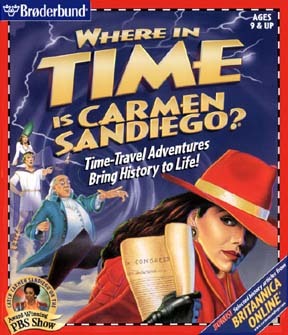 We resisted cable television, choosing instead to spend our media time playing Where in Time is Carmen Sandiego? 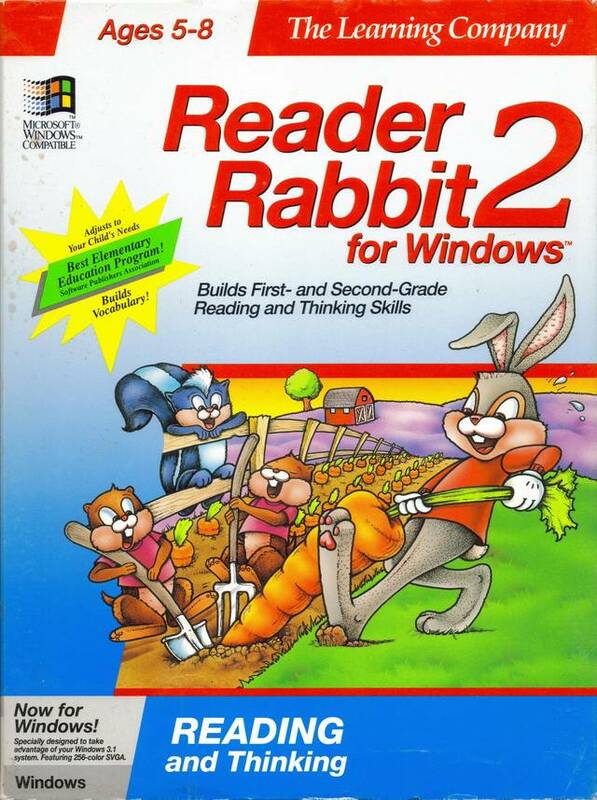 and Reader Rabbit on the desktop. My husband and I did have to set computer time limits, but screen time still had a clear definition (time watching media or playing digital games) and it was still easy for us, as parents, to maintain parameters. Navigating the digital world is not so easy for parents in 2016. In the years since my children were young, digital tools have become woven so intricately into modern society, and into our personal and professional lives, that the concept of screen time as my children experienced it is now obsolete. It is no longer wise – or even possible – to assent to one hour of media time, head for the kitchen, and call it good. If we leave our children to experience media without us, we risk a host of bad things. But the flipside is also true, if we leave our children to experience media without us, we miss great potential for family togetherness and relationship-building. We miss out on the amazing things that digital access has to offer. Current technology brings the potential to create, connect and learn deeply as never before. Via broadband access, we can video chat with Grandma who lives far away. We can research the type of dog that we hope to adopt, and we can make a digital scrapbook of our family camping trip. Web applications allow us to observe the tiniest of microscopic processes and glimpse the breadth of outer space. Perhaps in 2016 a new approach to screen time is in order. Instead of asking, How much screen time is ‘safe’ for my children?, we should ask, How will we as a family use media and technology to deepen our relationships and learn together? This new approach shifts the focus of technology from media minutes to quality of content, and it will foster our children’s understanding that digital devices are tools, not toys. An iPad shouldn’t be thought of as an entertainment device or a reward for good behavior; all connected devices – smart phones, tablets, laptops, and whatever is to come – should be seen as powerful productivity, learning, and creation tools. If our children are to grow up with wise media and technology habits, shouldn’t we, their parents and teachers, be the ones to teach and guide them in this arena? In our last post, we met the 2015-16 Elementary Design Team — 23 teacher leaders who together are paving the way to discover best practices for technology integration in the primary grades. Click here to read this short introduction, if you missed it last week! For this week, here’s another quick look at this important Team, 23 teacher-explorers on a quest of discovery! 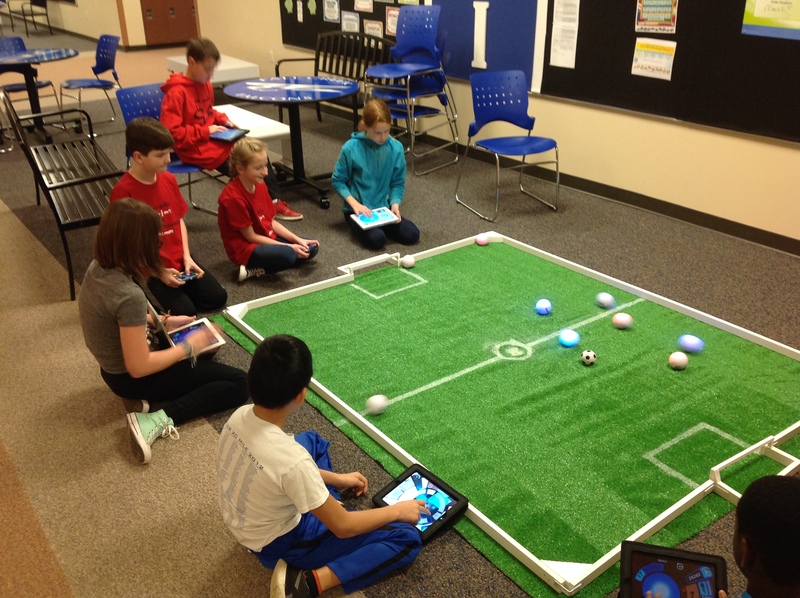 Yesterday HSE21 Shorts featured a new club at Fall Creek Intermediate School: Club Sphero. Club Sphero is essentially a computer coding experience where, as sponsor Brad Lowell puts it, “the learning is disguised within the fun”! What’s especially exciting to those of us who’ve followed Hour of Code (and realized what an essential skill coding can be), is the possibilities Sphero brings to the classroom. I asked Mr. Lowell how he and his colleagues plan to integrate Spheros and coding into their curriculum in the future. 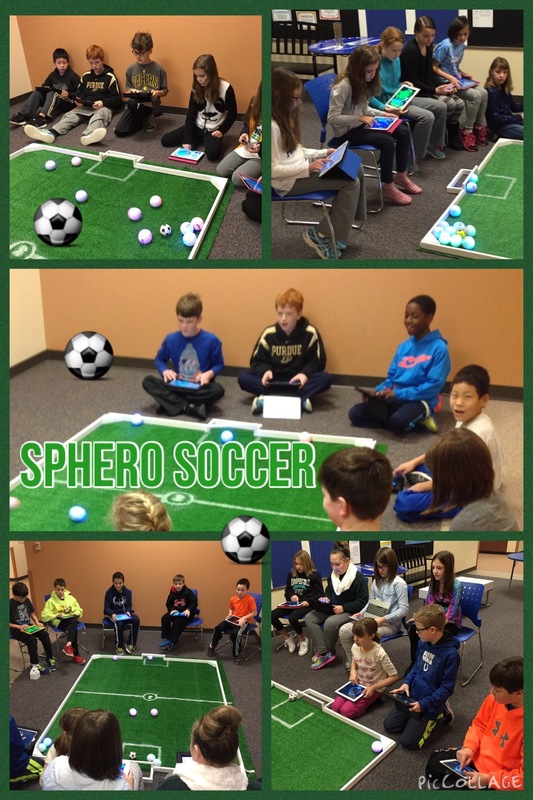 Have you used the Spheros in class as well? Or just during the after school club? Space: Coding moon phases; coding or creating orbits of planets; demonstrating the process of nuclear fusion in the sun where the Spheros are coded as atoms or photons; coding rotation vs. revolution and/or elliptical orbits. Matter: Spheros representing the particles in states of matter. I’m going to try this, see the attached picture.phase changes…using Spheros to represent subatomic particles when given an element.there’s got to be something we could do with physical and chemical changes. Technology: Engineering lunar rovers (Sphero powered) to navigate the moon’s surface (in sand); engineering boat/barges to transport mass over a distance; engineering Indy 500 racers to compete in a race in May; engineering Sphero semi-chariots to carry mass; coding obstacle course. Social Studies: Sphero racing to states and capitals on our outdoor recess concrete map. Math: Coordinate graph racing (race to a given set of ordered pairs) coding regular and irregular figures. What, from a teacher’s perspective, has been the best thing about this endeavor? The kids are picking up coding quickly and are really enjoying engineering around the Sphero. I love seeing them get excited about their learning. They like having the power to control their own designing and learning. To learn more about computer coding as a 21st century skill, check out the website of Code.org. 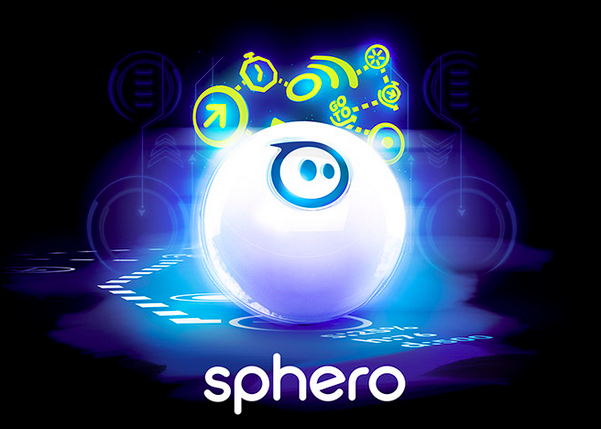 For more details on how objects like Sphero can help develop coding skills, visit the Sphero website. Many thanks to Fall Creek Intermediate science teacher Brad Lowell for sharing the evolution of Club Sphero. What a perfect example of using today’s digital tools to extend and deepen learning! How did Club Sphero get started? The club started almost on accident. I saw the Sphero for the first time at a birthday party for a friend’s wife. Listening to a teacher in Carmel talk about how they used them only started my wheels spinning. After showing my students the online video clips for Sphero, many said they already had them but didn’t really play with them much. I had them bring their Spheros in one morning before school and saw how much excitement they generated and the club just took off from there. My co-sponsor, Josh Tegrotenhuis [also a science teacher at FCI] had his kids bring theirs. Two weeks into our informal club, we had over 30 kids showing. We started off with a few old putting holes playing putt-putt golf with various obstacles, played some ‘World Cup’ Sphero soccer, coded bowling, and are now playing ‘Final Four’ basketball. The kids keep coming and they keep challenging Josh and I as teachers to come up with new fun ways of using the Spheros. The learning is really disguised within. the fun. We’ve coupled the club with 3d printing and it has taken us to a whole new level of design and learning. What skills, abilities, and interests are the students developing? Cooperation, coding, science, math, engineering, and technology. What do you think has made the club so successful? The club is very interactive and students get to use their devices. I think the kids really like learning outside the classroom and beyond the textbook. Keeping the learning game-oriented makes it fun and competitive for them.